Yesterday, I wrote about a new source for chrome legs to go with wall-mount, aka wall-hung sinks. Now that we have that problem solved (thank you, Franklin Brass), I offer several wall-mount sink models from Crane Plumbing to go with the legs. The first one at the top is particularly cool, don’t you think? It’s the Crane Yorkshire. The second simpler model is the Crane Norwich. NOTE THOUGH: Crane says that these are not designed for legs … I am going to do more research on this, as I have a hard time believing there are no holes for legs but meanwhile, take note. Another very good alternative is to buy a vintage sink at a salvage shop, tag sale, or even put an ad in your local newspaper — over the course of 5 years of hunting, I’ve seen a dozen or more available through these means. And see all my postings on retro-styled faucets. 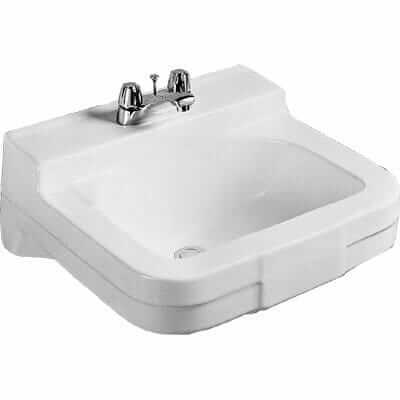 Note, some of these sinks are also available with 4″- and 8″-three hole setups. Finally – check your local Home Depot. Last time I was there, they also had wall-mount sinks reach to cash and carry. I purchased my grandparents’ house which was built in 1955. The bathroom was originally pink and green: pink and green plastic tile on the walls, green and gray rubber floor tile, and pale green Canadian Potteries (the Canadian Crane subsidiary) fixtures. Over the years, the fixtures eventually got pulled out and replaced – so when I bought the house, Re-store and salvage yards were high on the list. Green is hard to find matching, so I got nervous and picked white. At one of the salvage yards, I was able to pick up a white Yorkshire sink – WITH the original Crane chrome faucets still attached…for $20. Re-Store provided the white Neuday toilet. All we had to do was buy a toilet kit for the tank, pop some new washers in the faucets for the sink, install the works…and now we’ve got it made! Love your site, I thought I was the only person preserving a better time! Nice to know there’s more kindred spirits out there. If you need help, try deabath.com – they are the Crane experts.